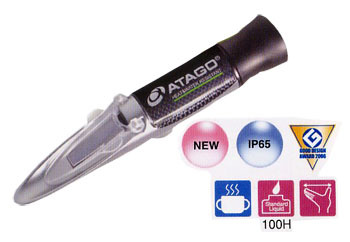 MASTER-Alpha Series hand-held refractometers with are the first to be equipped with Automatic Temperature Compensation and Water Resistant (IP65) at the same time. Whole instrument can be rinsed off with running water hygiene aspect and humidity protection aspect are improved with NEW feature. 7 different measurement ranges are available. Master-M Series are good alternative choice when Water Resistant feature is not a priority, and Temperature Compensation is carried out manually. Equipped with great features and specifications except the Automatic Temperature Compensation and the Water Resistant features. Master-H Series are the Heat Resistant models of the Master-Alpha series. 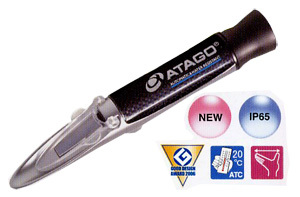 Designed for measuring high-temperature samples during cooking or boiling process at production sites. Corrosion resistant tempered glass prism are adopted to provide an extended service life. This instrument measures the salinity and specific gravity of sea water, and utilizes a new materia that is durable against salty samples. The salinity of seawater is displayed in parts per mille (0/00 ). 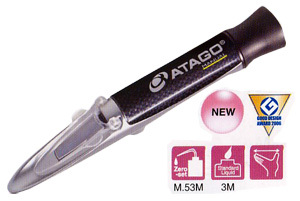 The Master-S/Mill alpha is rated IP65 (water resistant) and features Automatic Temperature Compensation (ATC). This instrument is designed to control the concentration of saltwater, such as in cooking or rinsing seafood, and utilizes a new material that is durable against salt and acidic samples. The Master-S10alpha is rated IP65 (water resistant), features Automatic Temperature Compensation (ATC), and has a measurement range of 0.0 to 10.0%. Units used for measuring the concentration of salt in water. For example : Preparation and Storage of seafood, Brining solutions & Concentration of salt used in cooking.